It's almost my birthday! Happy birthday to all the August babies! Last year I shared what's on my birthday list so I thought I might do that again! This year will be my golden birthday since I turn 26 on the 26th! So I thought I'd share with what my wish is for this year. Cause even though you're not supposed to share your wish I also believe in putting things into the universe. So my wish for my 26th year is to enjoy and laugh. I went through a few bummy years the past couple of years and then I hustled hard to accomplish so much. But I feel like life is passing me by and Im working hard for milestones or goals and as soon as they come Im on to the next. I want to celebrate my successes all year and just be more intentional with my time so I can really enjoy it. You know? My birthday list consists of a lot of Madewell and Anthropologie stuff because I love their stores but I find them a little pricey so I always put them on my list. Anthropologie just got all these new health and beauty items and I want to get my hands on some of them! First up are these exfoliating sugar cubes that sounded really cute and fun. Also I love tea and I like these mix of this tea box. I thought it was such a cute gift! I specifically put the skin one on my list because it needs some help! I also need a new yoga mat. I have been getting my fitness on lately, and my mat is starting to show it's age. So I saw this really cute one. Not sure on its thickness though and if it will be cushioned enough. I loved this jewelry stand and this cute vanity organizer. I think it will just make my makeup desk look more organized and grown up. The last two things from there are this desk planner. And lastly and maybe most importantly is my keep cup! I want to be more environmentally friendly so I'm getting a reusable cup to bring to my favorite coffee shops! I got a larger one to have iced lattes in! 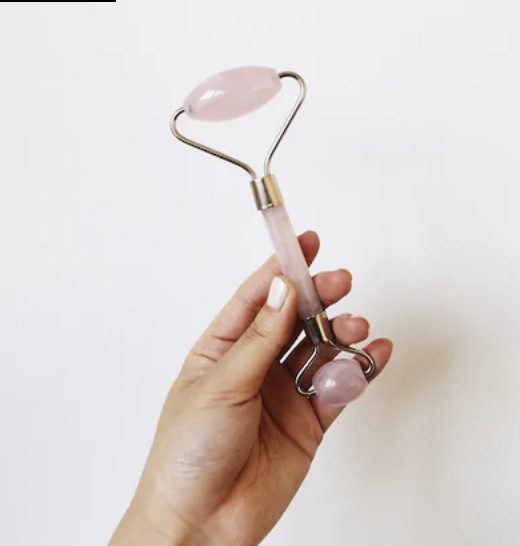 A gift I want to give to myself is this rose quartz facial roller. I've heard that this is good to get more circulation in your face which can help it heal faster. Also if you are putting product or oils on it helps them sink in more. Even if it doesn't do those things I think it will feel nice haha and rose quartz is known for healing. I felt weird asking someone for this, so I plan on buying it for myself! I am using the money I made back on Ebates because at the end of each quarter you can get that money turned into a gift card! Lastly, I picked out a few cute shirts from Madewell! Like this cute keyhole tank or this wrap top. I've really been loving their stuff lately it's just a little expensive for me to keep getting. I really want to try out these new road tripper jeans. Have you tried them at all do you like them? They seem like a less expensive option at Madewell. What's something you put on your birthday list?! Recipe Box - How cute is that! Speaker - I have an old jambox and it's been through a lot, time for a new one. Im liking the google home, do you have recommendations? Swell Waterbottle - This one is so pretty to me! When all else fails clothes! So tell me whats on your birthday list, or what is one of your favorite things you've ever gotten? Here are some of the items! Twenty-Four, 25 is right around the corner, yikes! Just kidding I'm excited for what is to come. I wanted to share what my birthday wish was for myself to set an intention and throw myself into it. I know it's usually bad luck to share a wish but I really want this one to come true and I'm hoping putting it out into the universe will help me to do that! The last two years of my life have been such a whirlwind I can't even begin to explain it, with moves, health scares, job changes, losing and gain friends, moving in with my boyfriend, there have been so many highs and so many lows. But I feel like on the roller coaster of life I am on an upswing. I find it so exciting and refreshing. So for turning 24, I really hope to take this year before 25 finding myself even more. Challenging myself to become better, learning what works for me what doesn't. And finding self-confidence, trusting my instinct and knowing I'm doing the best I can. I know that everything happens for a reason but I have seemed to lost sight of that. I really just want to spend this next year working on becoming the best version of myself, even if that means making mistakes. I'm excited for the highs and lows of this next year, I feel like some really big changes are coming!